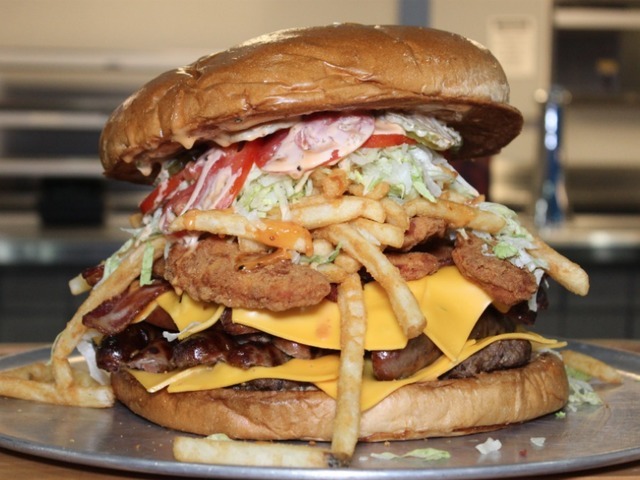 The Arizona Cardinals’ Burger Challenge: a burger the size of the baby. But that’s not all. Any one fan who can eat this $75 burger (and eat it in good health; no barfing allowed) within one hour will receive — Wow! — a free Arizona Cardinals football jersey!!! But here’s the Dijon moutarde on the bun: the fan will also get recognized on the team’s video scoreboard in front of a stadium full of appreciative football fans!!!! This is the kind of free-marketism and consumption for which millions of our American heroes have sacrificed all. A grateful Christian nation salutes you, Cardinals! *The Cardinals ask that you please rise and stand with your Cardinals cap over your heart and say grace to Baby Jesus before pigging out. Thank you.